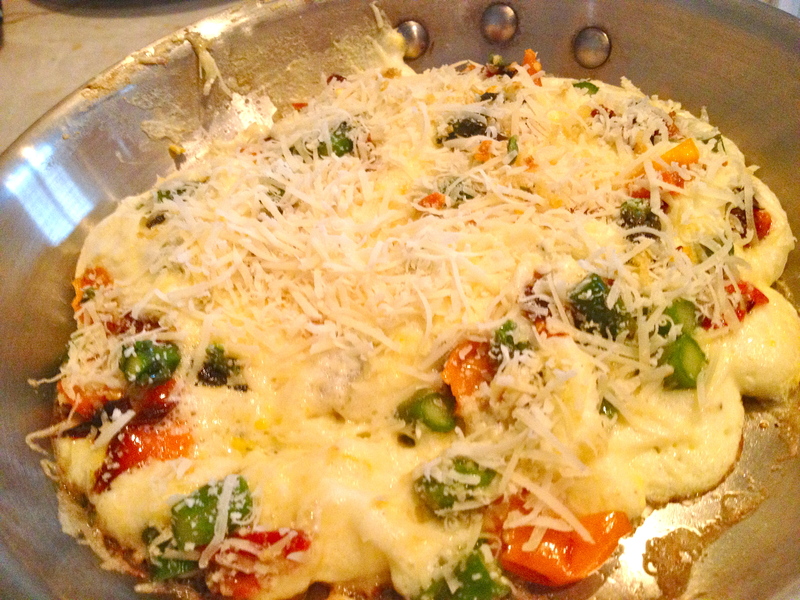 Souffled Omelet with Sweet Peppers and Asparagus. 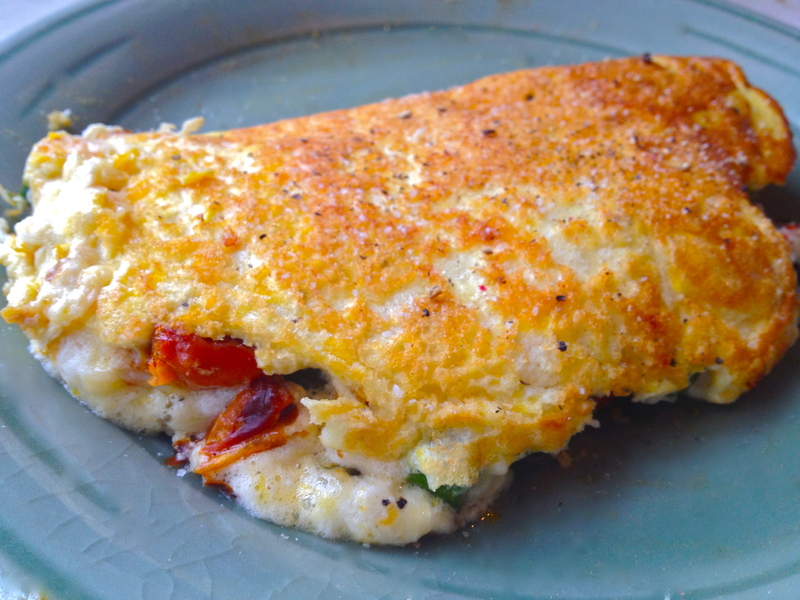 Introducing my new favorite breakfast item: the souffled omelet. So light it melts in your mouth, with a surprising textural contrast of the almost crispy bottom and the airy inner egginess. It’s a perfect example of how a simple change in technique can transform a dish. Rather than beating the eggs with a whisk (or even a fork) as you would for a standard omelet, this one is made by separating the yolks and the whites and fluffing them up pretty much as far as they can go—much like in a souffle. It’s a fun way to prep eggs and it makes them go so much further than they would in a regular omelet; just look at the photo, that big fluffy thing is a two egg omelet! And of course, you can stuff it with whatever fillings you like. I had some leftover grilled asparagus and mini sweet peppers, so I chopped them up and sprinkled them over along with the cheese. Thanks to Laura Calder for the recipe, who (as usual) inspired me to try something new, and (as usual) it turned out pretty groovy! Also pretty groovy: the truffle salt I used to finish the dish. Optional, but recommended. Eggs first. 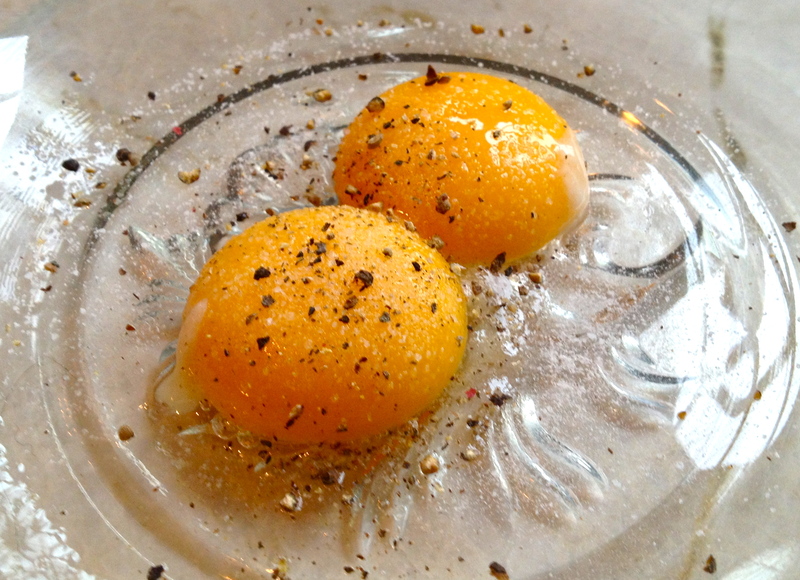 Put the yolks in a glass or metal bowl (they’re going over a double boiler). Season them with salt and pepper. Bring a small pot of water to a low boil in the stove, and set the yolk bowl over it (but don’t let the bottom of the bowl touch the water, or they’ll cook too fast.) 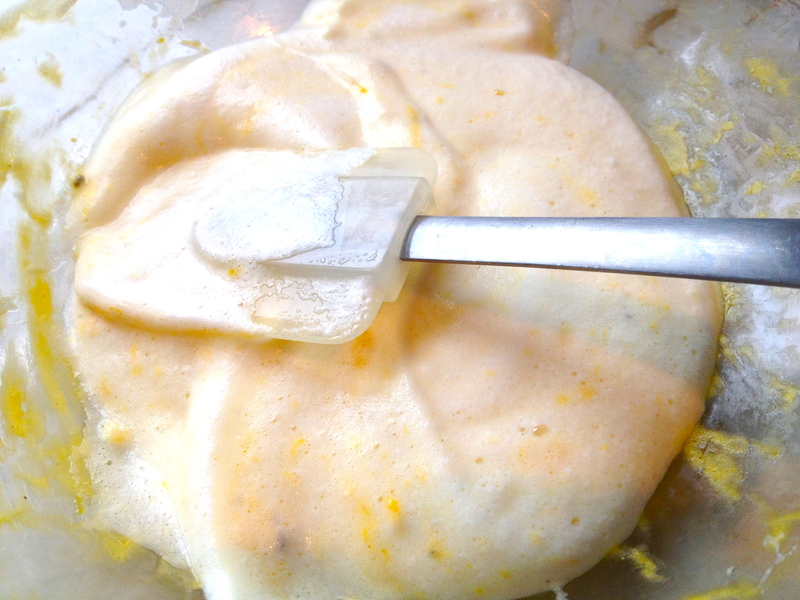 Using a whisk, beat the yolks over the double boiler until they’re ribbony, pale yellow, and just about tripled in size. 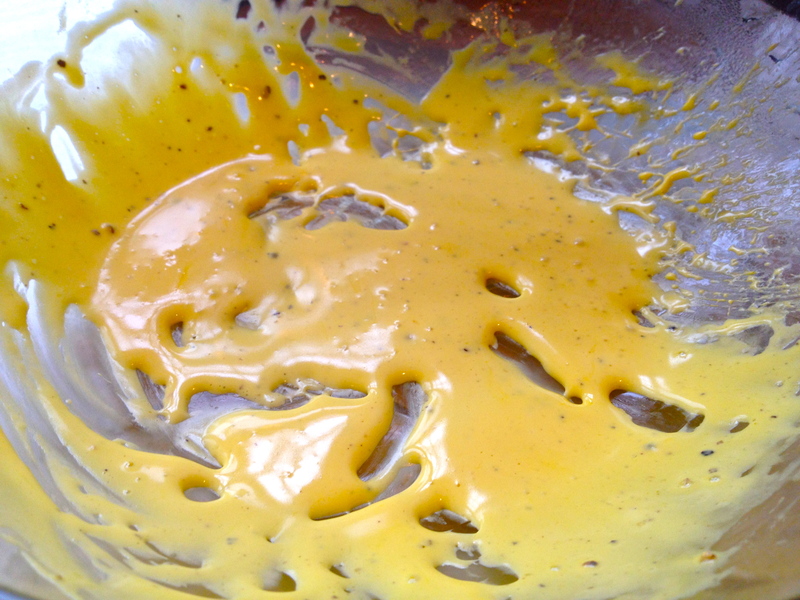 Scrape into the center of the bowl and set yolks aside. 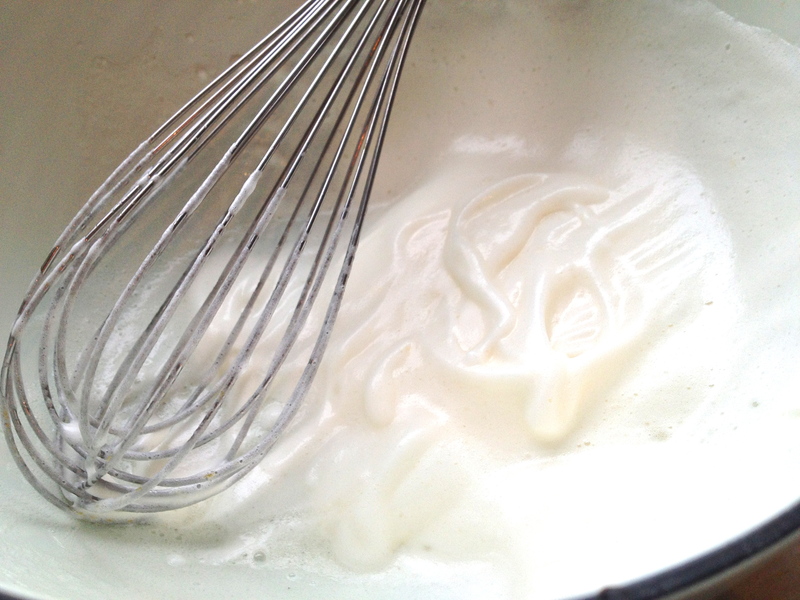 Next, use your whisk to beat the whites until they’re fluffy and stiff. Pour the whites into the bowl with the yolks. Using a spatula, gently fold them together. Heat a pan over medium high and melt the butter. 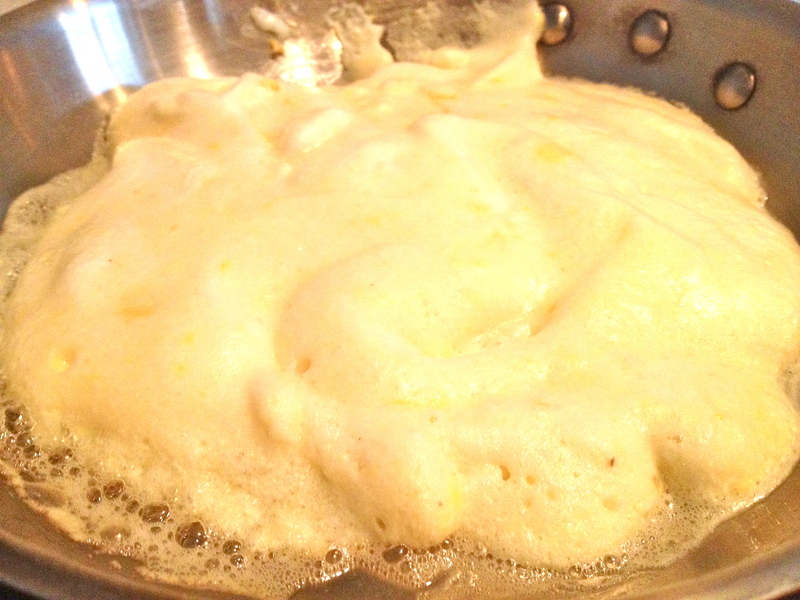 Pour the fluffy eggs into the pan and cover with a lid. 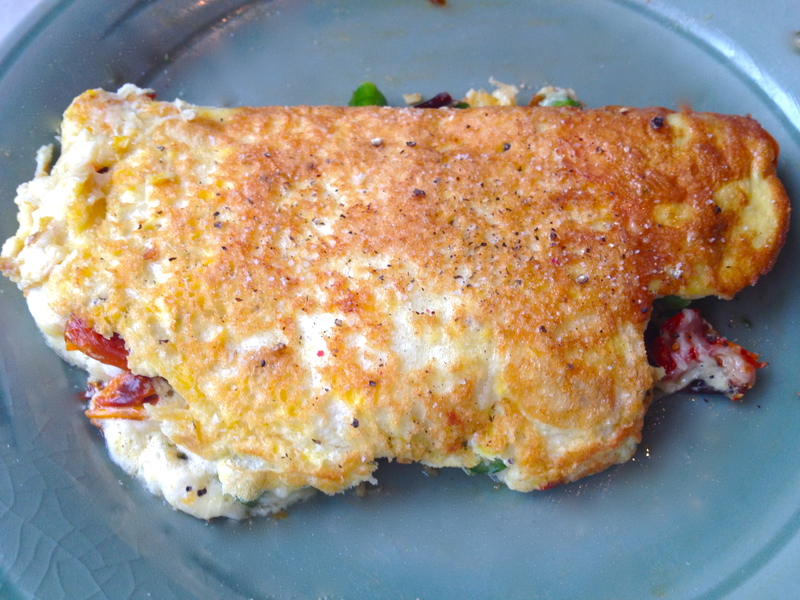 When the bottom is starting to turn golden brown and the foaminess on top is starting to firm up a bit, spread your veggies and cheese over the whole surface of the omelet. When the bottom is browned to your liking, gently loosen the sides of the omelet from the bottom of the pan and carefully slide it out. As you do so, fold one half of the omelet over the other. Sprinkle with pepper and truffle salt, if you’ve got it, or else regular salt. Then just float away on this cloud of a breakfast (or lunch, or dinner….). Previous Blackened Onion and Lentil Pilaf. Next Spinach and Tomato Tart with Bleu Cheese. That. Looks. Amazing! I must try making souffled omelette sometime! Thanks :) It’s one of those things feels fancy but is actually pretty simple to make – so good! It would totally make a good dinner. So fast and flexible enough that you can throw pretty much anything into it!